We have just returned from our five days in beautiful Seattle. We had a great time! For any of you considering where your next vacation will be I encourage you to consider Seattle. There was so much to do and experience, I have to break my Seattle recap into three different posts. Today’s post will focus on the city of Seattle sights. A kid friendly city, we had no trouble using public transportation to get around. All the sights we visited were stroller friendly and our little guy loved every moment of it. We first visited the International Fountain and enjoyed a choreographed water and music show. We continued our walk and found ourselves in awe of the Space Needle. We took a ‘break’ and visited the Chihuly Garden and Glass Museum. The next day we visited the famous Pikes Place Market. Left Pikes Place Market to enjoy other sights of Seattle. The day was gorgeous. There was a light breeze and bright blue skies. We then stopped at one of my favorite sights of the entire trip the Seattle Public Library. We took a moment to appreciate the Olympic Sculpture Park and later in our trip visited Bruce Lee’s gravesite. We indulged our love for music at the EMP Museum where we recorded our band, 3 Miles Island’s, first music video. Turns out our little guy is more of a DJ than a drummer. We took a ferry to Bainbridge and admired the Seattle skyline. We ended with one last view of Seattle from Kerry Park. Have you been to Seattle? What’s your favorite sight? This post is long overdue, especially since we went to the Chicago Botanical Garden in the Spring and now it is Summer. For those of you looking for baby friendly environments that will coincide well lulling baby to sleep, the Chicago Botanical Garden is a great destination. 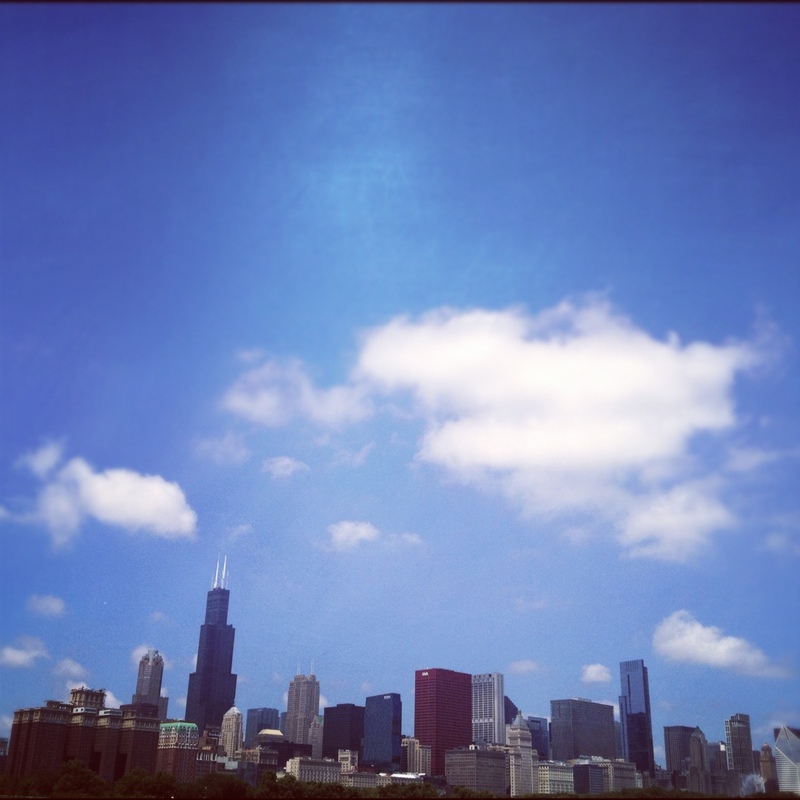 Located north of the city of Chicago, it is a quick car ride, or if you prefer, Metra train ride away. The garden is peaceful, has plenty to look at and enjoy, stroller friendly, and a nice place to spend an afternoon. We liked it so much we got an annual pass. Maybe we will see you there? A lunch date? You must think I’m crazy, with a newborn, you hardly have time to shower somedays right? Well, as difficult as it can be to get things together enough to take a trip outside, once you feel your little one has settled into a somewhat predictable routine, I encourage you to plan a lunch date. My first lunch date was with my sister, who at the time was visiting from beautiful, sunny, San Diego. Choose a casual restaurant that you have seen families dine at. Make sure they have enough space for your stroller or car seat. Consider the menu. Does it have food options you can eat with one hand? You may have to hold your little one while you eat. Have lunch with a friend that is understanding of a crying baby. Be flexible. This could mean having to cancel your lunch date, move it to a later time, change the location, or cutting it short. It all depends on what your little one needs at that moment. For those of you living near downtown Chicago like me, below is a list of some locations I have gone to with my little guy. I consider these places baby lunch date friendly. Macy’s on State Street. Their food court has many options. Lots of space for your stroller. Keep in mind, the food court closes at 3pm. Melis on Halstead. This restaurant has always been a favorite of mine. It is usually very busy, so I make sure go after the lunch crowd and have lunch at 1:30 on a weekday. The crowd is much smaller then. Consider leaving the stroller at home, they don’t have much room for a stroller. I brought my little guy here in his infant carseat. Protein Bar on Washington. This place is a great place for a healthy lunch. I have had lunch here with my little guy several times. The wraps are easy to eat while holding a baby. Protein Bar’s downtown locations are closed Saturday and Sundays. India House on W. Grand Ave. I love Indian food. This place offers a great lunch time buffet. Since all the food is already prepared, it is a quick meal with lots of options. Their lunch buffet ends at 2:30pm. Atropolis on Halstead. This cafe is roomy, has delicious sandwiches and tasty pastries. It’s a great place to meet a friend for lunch. There’s plenty of room for your stroller. Perez on Randolph. For the Mexican food lovers out there, this restaurant is a great option for lunch. There’s room for your stroller. Whole Foods in the South Loop. With their many food options, you could meet a friend here. Maybe your friend could even help you do some quick grocery shopping. Do you have any restaurant suggestions for other moms out there? If so, please share. For all you new moms out there, I am sorry to break the news to you, but you will need some transitional clothes after childbirth. I was hoping I would be one of the lucky few who by their sixth week postpartum could fit back into my pre-pregnancy skinny jeans. That did not happen. I was somewhere in between really loose maternity clothes and too tight pre-pregnancy clothes, I needed some in between clothes for my in between body. Now, I’m not talking about a quick trip to get some milk, I am talking about a good two hours to get yourself some new clothes. While you are adjusting to mommy life, it is important that you look and feel good. Wearing your maternity clothes and knowing you won’t fit into your pre-pregnancy clothes can be frustrating. You deserve to treat yourself out to some new clothes that fit your current body. In planning for this shopping trip I would suggest enlisting some help from someone you trust. It should be someone who will be honest with you about how you look and can help care for the little one while you try on clothes. For my first shopping trip out, I went with my sister. We had my little guy in the stroller, walked out to Chicago’s State Street. We browsed Old Navy, Forever 21, Ann Taylor Loft, H&M, and Macy’s. Since the clothes I was purchasing are transitional pieces, I didn’t want to spend too much on them. I ended up buying a pair of pants and a blouse from Ann Taylor Loft, a blouse from H & M, a pair of electric blue colored jeans and a cardigan from Forever 21. I consider it a successful shopping trip. By the end of the week, I was wearing clothes that fit and felt much better about my appearance. So what are you waiting for? Get on the phone and plan that shopping trip! 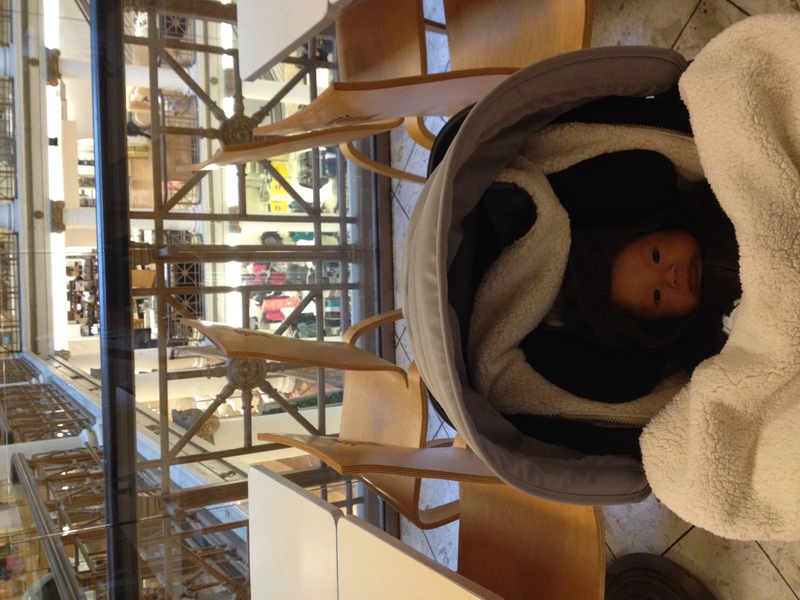 Below is a picture of my little guy at Macy’s on State Street. 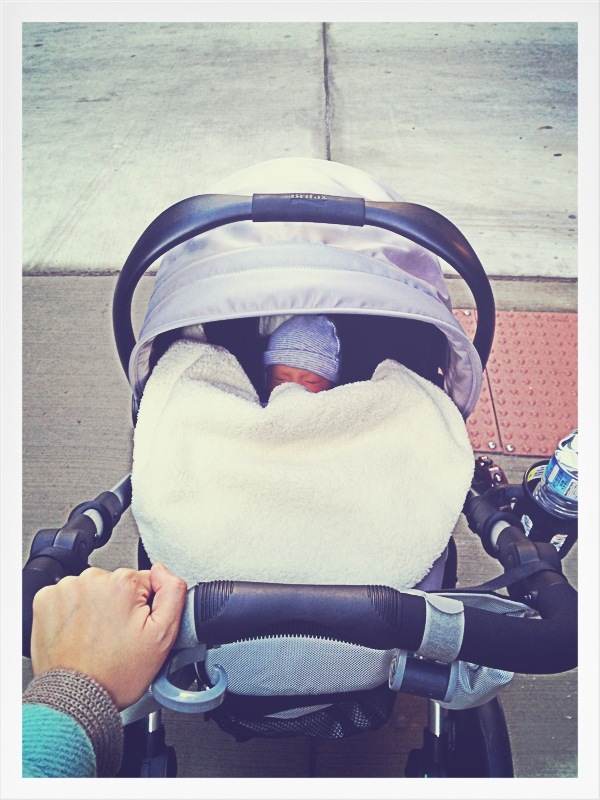 This is the beginning of my feature, Mommy and Me Out and About. It is about things to do with your baby. When I first had my little guy, the thought of leaving my home was admittedly stressful. I figured, best to take baby steps (pun totally intended). So I took a walk around the neighborhood. It took about 1.5 hours to prepare for that short walk, but it was just the beginning of what became our daily two-hour walks downtown. Why did it take an hour and a half to get ready you ask. Let me explain. Once we were out the door, I had a 30 minute window. After 30 minutes, I would then return home because it was time for his next feeding. Was it worth all the trouble to get out for only 30 minutes? Yes. For new moms out there, fresh air will be good for you and for the little one. Even a short walk around the neighborhood will help you feel a little more like yourself. For mom’s wondering how to dress their little one for winter trips outside, check out my past post: Taking Baby Outside During the Winter . Below is a picture of one of my first trips outside with my little guy. For anyone curious what type of stroller I use, it is the Britax B-Ready with a Chaperone infant car seat. It is mentioned in my previous post: Mommy Product Review: Top Five Products I Use Everyday. What was your first trip outside with your little one like?